Despite strong assurances from the Power and Energy Ministry that power cuts imposed due to the sudden breakdown of the Norochcholai coal power plant on Monday, people are left without electricity for three to four hours at times. Households and business large and small, are all counting the cost of power cuts and failures. The power interruptions in turn have raised questions about future supplies and whether the Ceylon Electricity Board (CEB) can ensure uninterrupted power with only three more weeks left for the Sinhala and Tamil New Year. “These unannounced power outages have hurt us badly, We have lost millions. Much of the bread dough had to be thrown away due to the loss of power,” complained Bakery Owners Association President M.K. Jayawardena. “When the power goes out during baking, an entire batch is ruined.’’ Pre-prepared dough also goes to the waste bin. He said most members cannot afford back-up generators. “Even after the ministry said the power situation is fixed still more power outages occurred, although they were shorter in duration,” he said, pointing out that orders for functions, restaurants, and weddings taken by small scale bakery owners cannot be delivered. Smaller businesses such as printers and ‘communications centers’ have been badly affected. “The unannounced power outages affect our business. Each time the power goes out, our printing and photocopy machines reset and need to be reprogrammed,” claimed Ruwan Botheju, a communications center Owner in Rajagiriya. “It affects our planned printing jobs and causes inconvenience to our clients,’’ he said. Mr Botheju also said frequent power outages could damage electronic equipment and that could mean repair costs. Fish vendors are also concerned. “Fish prices are already high, and people don’t want to buy fish when they know there has been a power outage,” argued K. Pushpakumara, a vendor in Bataramulla. He explained that many small-scale vendors buy on credit and face repayment problems when the stock is ruined due to lack of refrigeration. The Ceylon Electricity Board Engineers Union President, Saumaya Kumarawadu, told the Sunday Times that the board faces a shortage of 300 Megawatts of some 2,600MW needed every day, thereby triggering power failures. The problem has been building up over the years due to the failure of authorities to implement at least five key proposed power projects due to a variety of reasons. According to the engineers union, since the completion of the final stage of Norochcholai power plant in 2014, not a single power station was built to meet the increasing electricity needs in the country, leading to the current crisis. The union claims the projects were “stopped or purposely delayed” by organised groups with vested interests eager to promote projects beneficial to them. They blamed politicians, senior officials in the ministry as well as members and officials in the Public Utilities Commission of Sri Lanka (PUCSL). A long-lerm, least cost electricity generation plan prepared by planning engineers in CEB was finally approved by PUCSL in 2018 amid severe pressure by the Engineers Union. The engineers raised issues about the transparency of the proposed LNG projects. The proposed Sampur power station with a capacity of 500MW was the next biggest power station to be built after Norochcholai and due to be completed by next year, but the project was held back due to a range of reasons. Earlier, a long-term power generation plan prepared by the CEB up to 2034 was sent to the PUCSL in 2016, but was delayed for more than a year and approved only with fewer power stations. Another proposal to add 230MW of LNG power to the national grid by this year has run into controversy with seven companies placing bids for the tender and authorities attempting to favour one bid from a South Korean company. The CEB Engineer’s Union objected to the move and eventually all bids were evaluated, but this has run into legal issues. Meanwhile, the government is attempting to build three more LNG power stations through several companies from Japan, India and China, but the engineers union claims that there is neither any appropriate proposal nor any agreement on pricing to date. Approval for another 100MW and 24×4 MW power stations which are to be fuelled by heavy furnace oil — proposed as medium-term solutions — has been further delayed with engineers refusing to sit on the technical evaluation committee. The CEB Engineers Union claims that six months have passed after the draft tenders were submitted for ministry approval, but the secretary to the ministry is proposing alterations to technical specifications to appease a few individuals with business interests. The union also claims that due to long delays in implementing low-cost coal and LNG power plants, several interim proposals were also made for a number of furnace oil-fuelled power plants as an alternative to the costly diesel powered plants, but the ministry had delayed approval for the bidding process. They claim that delaying tactics of the ministry in granting approval for the bidding process to continue would eventually lead to a situation where emergency power purchases at exorbitant rates from the private sector is the only option left. Cabinet approval was obtained for purchase 100MW of power from diesel generators during the first few weeks of February, but the plan did not materialise. Discussions on power purchases from Ace Matara and Asia Power which could yield 70MW has been suspended by the ministry, the unions claim. The hydropower generation capacity, too, has been dropping due to the adverse weather. 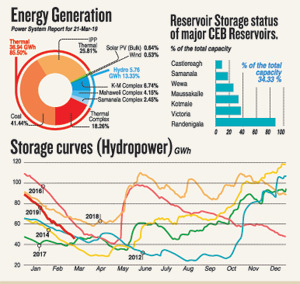 The capacity at Castlereigh and Maussakele Reservoirs have dwindled to 8% and 25%, respectively. The capacities in reservoirs of the Mahaweli complex, including Kotmale, Victoria and Randenigala, are at a minimum. The remaining water in these reservoirs is needed for irrigation and the water released for hydro generation has been curtailed by the water management committee. However, the Secretary to the Ministry of Power and Energy, Dr Suren Batagoda, told the Sunday Times that the crisis was not a result of the development over the past three to four years, but a long standing issue. He said one of the reasons was that the engineers had declined to sit on technical evaluation committees resulting in the delay of project approvals. “We have even asked the engineers to put forward the least cost of the supply of power so that we can ask bidders if they could provide power at those prices so that we can get the projects moving,’’ he said. Dr Batagoda said disputes between the engineers and the PUCSL were also worsening the power crisis. The unannounced power cuts are also adversely affecting exporters including the tea and apparel industry. “Tea Exporters are very concerned about the frequent power cuts and power interruptions,” Mr Jayantha Karunarathne, chairman of the Tea Exporters Association of Sri Lanka told the Sunday Times. “To continue with our production to meet shipment deadlines we need to use generators. However, using generators is expensive [and] that could have an impact on our costs depending on the duration of power interruptions,” he explained. “The apparel industry is very concerned about the power crisis and unannounced power cuts, we have strict time lines for deliveriesm,” Mr. MPT Cooray, the general secretary, Joint Apparel Association Forum of Sri Lanka, told the Sunday Times. 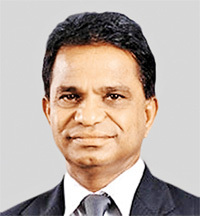 “Fake news on social media and communications platforms regarding pending power outages created disruptions and had compelled some companies to obtain back up power sources at significant cost,” said Rohan Masakorala, the chief executive officer, Shippers Academy Colombo. He is also chairman, Advisory Committee for Logistics. Mr Masakorala pointed out that while the power disruptions haven’t had a significant impact on shipping yet, a prolonged power crisis and unannounced power cuts, may complicate matters. He said the authorities need to be proactive to reduce the spread of fake news.